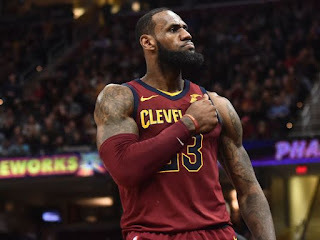 The King is still the king, the Cavaliers’ fans never doubt it, nor did Boston’s when Lebron “the King” James brandished his sword to guide his team back to a National Basket Association (NBA) final and fight for the title. With this victory, Lebron James gets consecutively for the eighth time to a final of the best professional basketball in the world. It only remains to wait if the dream will become true or not. So far, they are the Eastern Conference’s champion leaving in their own arena a Celtics team that soaked the shirt out and believed to reach the final easily. In the fifth game of the series the Cavs showed obvious fatigue. The Knights of Cleveland had lost the edge of their swords and their king, the undisputed leader in this Conference final, was in the doldrums. Blocked shots, three-point shots, dribbling, shooting from the court lines, the Boston’ Celtics performed did everything in the TDGarden court. The brilliant performance of the Celtics occurred in the presence of Cleveland’s monarch who in the previous two games carried his team on his shoulders. The Cavs are embodied by Lebron James. His mood and physical conditions deeply influence on the results of the team. So it happened during the fifth game, a confrontation where the young Celtic player Jayson Tatum showed off evidencing great potentialities to be the rookie of the year. Likewise, Baynes, a whole titan, damaged the offensive of the Knights who, in front of that man-wall, could do very little. In that fifth game the loss of balls diminished the Knights in their attacks. The average of effectiveness registered quite discreet numbers that took the Cavs to their defeat. However, the story would be another in the sixth and seventh games. The margins of errors were reduced and again the King got up searching to win his eighth consecutive ticket to an NBA final. Lebron made it very clear in this playoff why he has been NBA’s MVP four times. It was not given to him, he had to fight for being the most valuable player; attack after attack, shot after shot, James made the Cavaliers game and his own shine. In this seventh game, he scored 35 points, 15 rebounds and nine assists as he led the Cleveland Cavaliers to a defining victory with a score of 87-79 over the Celtics, eliminating Boston in the seventh and final game of the Eastern Conference finals. Although the Boston did not give up, the most NBA winner team so far fought tooth and nails in this last game. In fact, six minutes before the final whistle they were winning 72-71, but the dream of returning to a final vanished when the Cavs took the lead by scoring 15 of the next 17 points in a match that registered the lowest score between the both teams. Yet, Boston’s Jayson Tatum got an outstanding ovation during these playoffs; he played as if he was the most experienced in the league. In this seventh game he was no less and scored 24 points for his team, while the Dominican Al Horford did 17 points and Marcus Morris scored 14 points and 12 rebounds. Nevertheless, the road to raise the NBA's top trophy will be harder for the Cleveland Knights that have had to rely on Lebron in almost every match. Whether the Rockets or the Golden State, the Cavs' rivals have a difficult task to carry out. Both teams have a very similar offensive approach and are by far, the best selections of this season. Both teams have dream tridents and they provoke nightmares to any defense. The three-point bombs will leave the Cavs lying on the ground. On the other hand, the King of the Knights is exhausted. James has played in the 82 games of the regular season and already has played 100 this year. The number of minutes played will take its toll on James who knows he will have to dress up as a leader again for the finals, unless Jeff Green (in substitution of Kevin Love) and Tristan Thompson help him, something unlikely. The knights will rest in their headquarters and sharpen their swords waiting to take the Golden State or avoid the Houston’s Rocket. Now, they are champions of their Conference and will surely go for more.